T120: Multi-point Heavy Duty ROPS. Clears normal trim and dashboard. Includes spare wheel mounting on rear hoop and additional brackets for spot lights and beacons. "Y" bracing in B hoop.This ROPS offers protection for all passengers and includes Safety Devices trademark flexible linkage system to minimise vehicle body fatigue. For standard vehicles without a sunroof. For use with curtain airbags. T121: Multi-point General Purpose ROPS. Clears normal trim and dashboard. 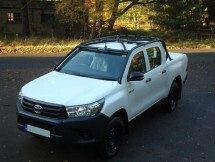 Includes spare wheel mounting on rear hoop and additional brackets for spot lights and beacons. No bracing in B hoop.This ROPS offers protection for all passengers and includes Safety Devices trademark flexible linkage system to minimise vehicle body fatigue. For standard vehicles without a sunroof. T122: Multi-point Heavy Duty ROPS. Clears normal trim and dashboard. Includes spare wheel mounting on rear hoop and additional brackets for spot lights and beacons. "Y" bracing in B hoop.This ROPS offers protection for all passengers and includes Safety Devices trademark flexible linkage system to minimise vehicle body fatigue. For standard vehicles without a sunroof. T123: Multi-point General Purpose ROPS. Clears normal trim and dashboard. Includes spare wheel mounting on rear hoop and additional brackets for spot lights and beacons. No bracing in B hoop.This ROPS offers protection for all passengers and includes Safety Devices trademark flexible linkage system to minimise vehicle body fatigue. For standard vehicles without a sunroof. F154: Multi-point external/internal bolt-in ROPS, clears normal trim and dashboard. "X" bracing in B hoop. Includes spare wheel mounting on rear hoop and additional brackets for spot lights and beacons. This ROPS offers protection for all passengers and includes Safety Devices trademark flexible linkage system to minimise vehicle body fatigue. For standard vehicles without a sunroof. For vehicles with curtain and thorax air bags. F155: Multi-point external/internal bolt-in ROPS, clears normal trim and dashboard. No bracing in B hoop. Includes spare wheel mounting on rear hoop and additional brackets for spot lights and beacons. 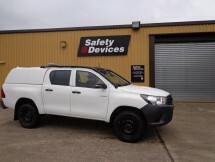 This ROPS offers protection for all passengers and includes Safety Devices trademark flexible linkage system to minimise vehicle body fatigue. For standard vehicles without a sunroof.